October in Florida is a time of transition. Florida has two dominant seasons: the wet season, which runs from May to October, and the dry season, which runs from October to May. The division between the wet and dry seasons is usually fairly predictable and quick. Sometime within the second week of October the humid and rainy pattern of the summer ends and the air masses tend to be drier. That isn’t to say we still can’t have some days with rain, but generally that is the trend. We seem to have crossed over this past weekend into that dry season. This month is also the peak month for bird migration through the central part of the state, and many of Florida’s winter residents are beginning to set up house and gather in places where food and shelter are plentiful. My goal, initially, was to head to Viera and check out the Click Ponds to see if any waterfowl or shorebirds have begin to congregate, but the gate to the roadway to the ponds was closed, and it remained so all morning. I used that as an opportunity to head to the Moccasin Island Tract for an hour or so. Interested readers can check out my blog posts here and here for previous adventures to this conservation area. On the way along the road toward the parking area a large white bird caught my eye, far off in one of the fields (I think much of the area is a sod farm). The shape didn’t look right for an egret, but it didn’t seem tall enough to be a Whooping Crane. 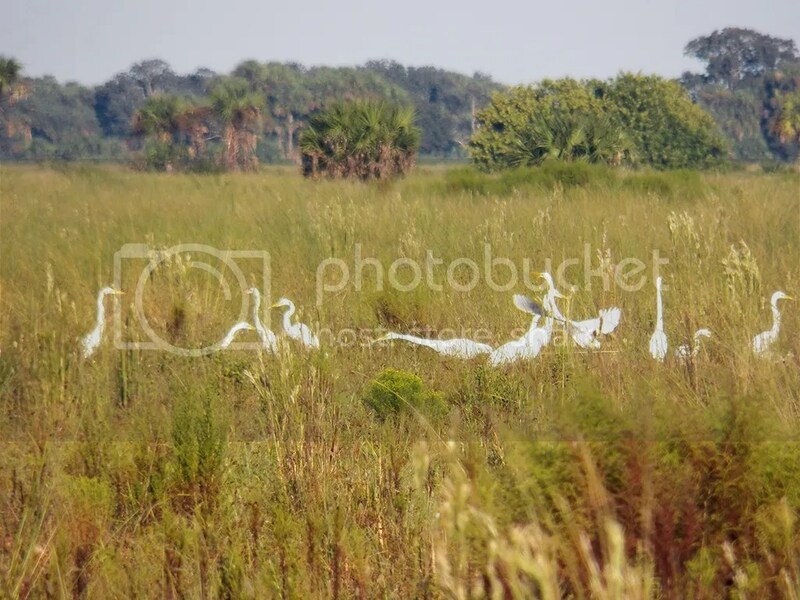 While we do have Whoopers in central Florida, associated with the Deseret Ranch, it would be quite a “thing” if one were to turn up in Viera! I stopped the car and took out my binoculars and had a look. It was an American White Pelican, standing by itself on a patch of sod. There were no other pelicans anywhere that I could see. As I watched it preen a little and look around, I wondered if it was tired and just plopped itself down wherever it could as I’ve never seen a pelican either not flying or floating. I arrived at the parking area with the sun still pretty low, but it was warming up fairly quickly. I was first greeted, as I usually am at this location, by the singing of Eastern Meadowlarks. The fields adjacent to the dirt road leading north from the parking area were still covered in standing water from all the rain we had in last few weeks, and I flushed a couple of Wilson’s Snipes as I walked along. Most of the fence posts were occupied by Tri-colored Herons, who nervously watched me go past. Herons sometimes strike the goofiest of poses, thanks in part to their long and flexible necks. Standing on one foot only added to this bird’s charm. Further in the flooded fields were congregations of Great Egrets and both White and Glossy Ibises. Occasionally two or three ibises would take off and fly in a big circle around the fields and then land back with the group. 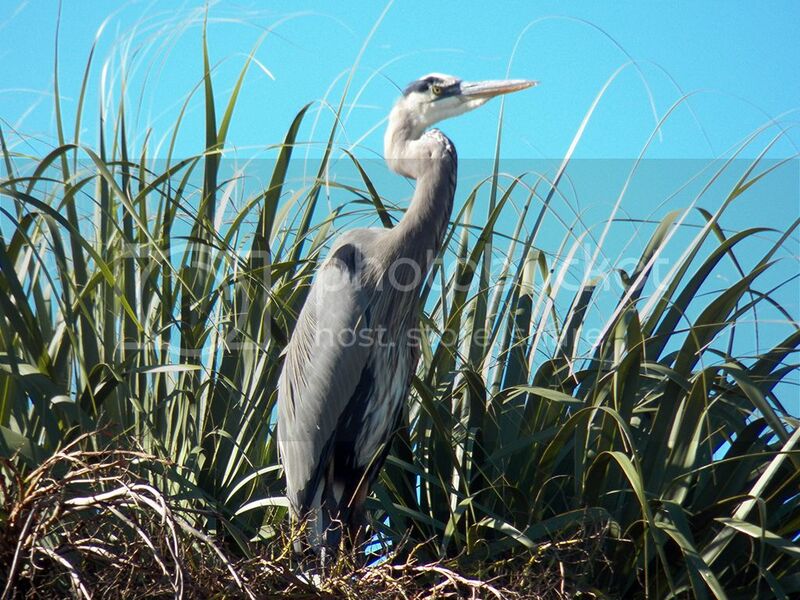 Herons and egrets are usually silent, except for alarm calls when startled or otherwise flushed out. When they are in groups like this, they have a surprisingly varied set of vocalizations. I didn’t walk far up that particular path, since I wanted to explore along the drainage canal and road to the west of the parking area. As I walked back, a small flock of Bobolinks flew past. These had been reported over a week ago on the BRDBRAIN e-mail list, but I figured they were gone, so that was a pleasant surprise. As I approached the parking area, I could hear American Crows and a Red-shouldered Hawk nearby. There were Belted Kingfishers chasing each other around as well. 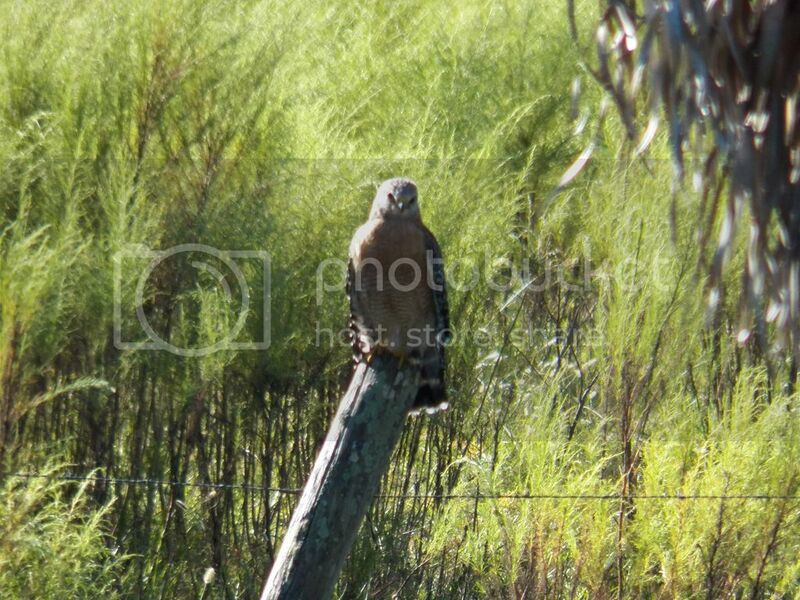 Some Red-shouldered Hawks in Florida are of a paler form that I don’t usually see until winter. This one may have just gotten its adult feathers. This bird seemed inexperienced and a little clumsy, despte the adult plumage. Along the path to the west, my presence stirred up some Northern Cardinals and some scolding notes that later turned out to be House Wrens. None of that ruffled the feathers (actually or metaphorically) of this Loggerhead Shrike. 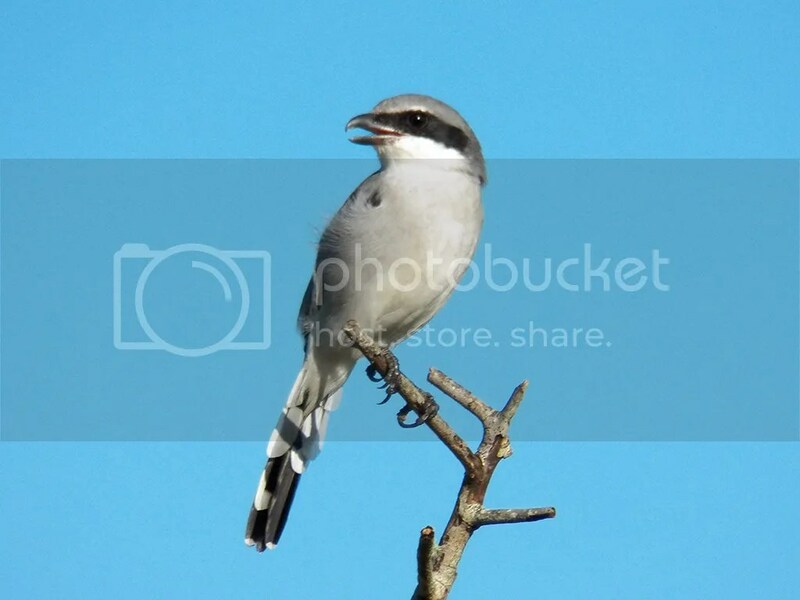 Shrike populations are declining in many areas around east central Florida as we pave over more of their preferred habitat. It’s good to see them holding their own in conservation areas like this and Stick Marsh. 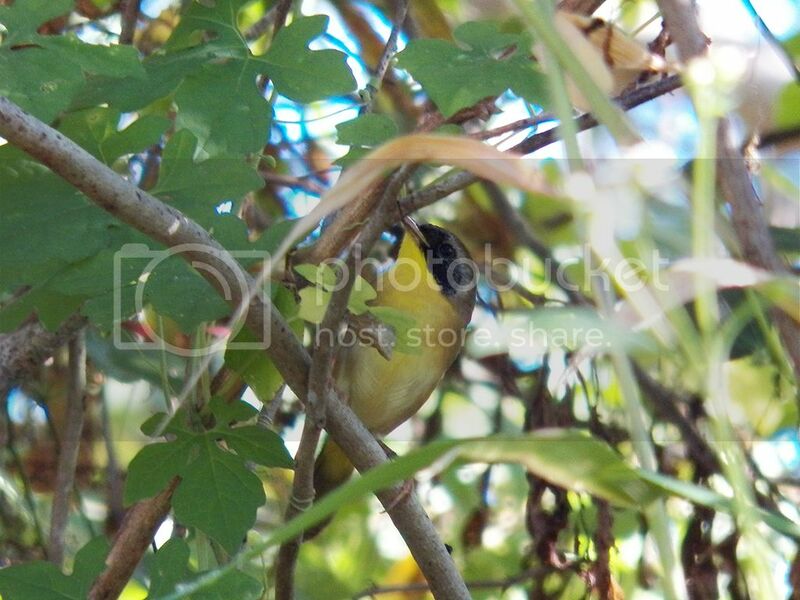 Along with the quite agitated House Wrens was this handsome Common Yellowthroat that popped out to check me out for a few seconds before disappearing back into the dense brush. Whenever I’m birding I try to stay in the habit of looking up now and again to see what might be there. This is particularly useful in catching raptors or other soaring birds that might be circling on thermals high overhead. This time I was surprised by a relatively large flock of Roseate Spoonbills. Normally I only see one or two at a time, so I felt this was a real treat. 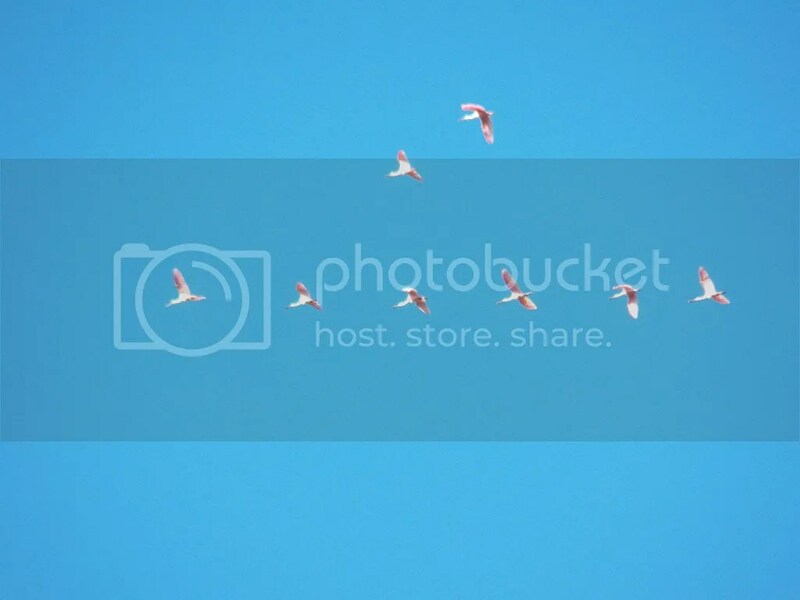 Roseate Spoonbills doing the Missing Man Formation. 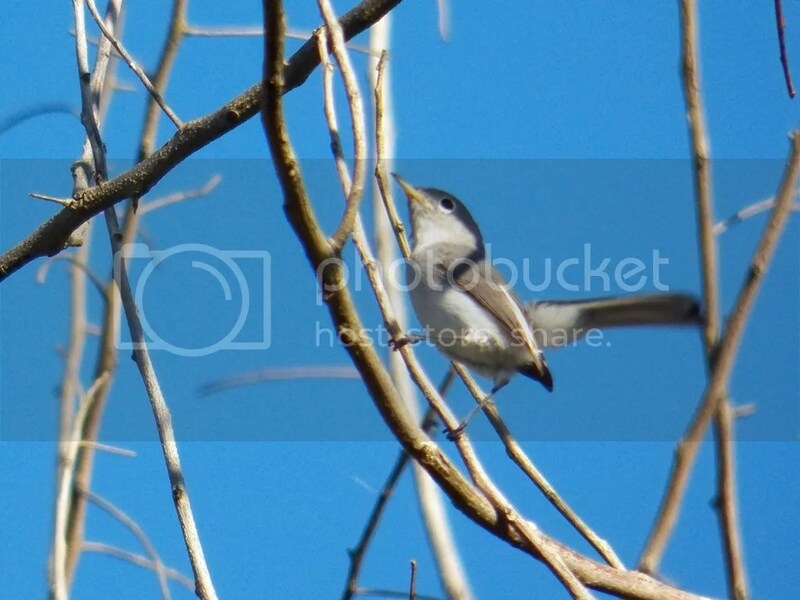 No birding trip in east central Florida would be complete without those tiny bundles of energy, the Blue-grey Gnatcatchers. This is one of several that was scolding me along with the House Wrens and Northern Cardinals. Ever-present and always fun to watch! I soon found my path blocked by a submerged section of the path with no way around it. Forced to turn back, I flushed some Common Ground Doves from the brush edges and watched some Blue Jays harass the Red-shouldered Hawk. Before getting in the car to head to the wetlands, I watched a pair of American Crows walk through the parking area and saw an Eastern Phoebe perform some impressive acrobatics in pursuit of food. At the top of a palm tree stood this Great Blue Heron, a fitting end to the first part of my day. Looking far more serious and determined than its smaller cousin at the start of this post, this Great Blue Heron had a commanding view of the landscape. Here’s the complete species list, including those from the Ritch Grissom Memorial Wetlands at Viera, which you’ll get to see in part 2. 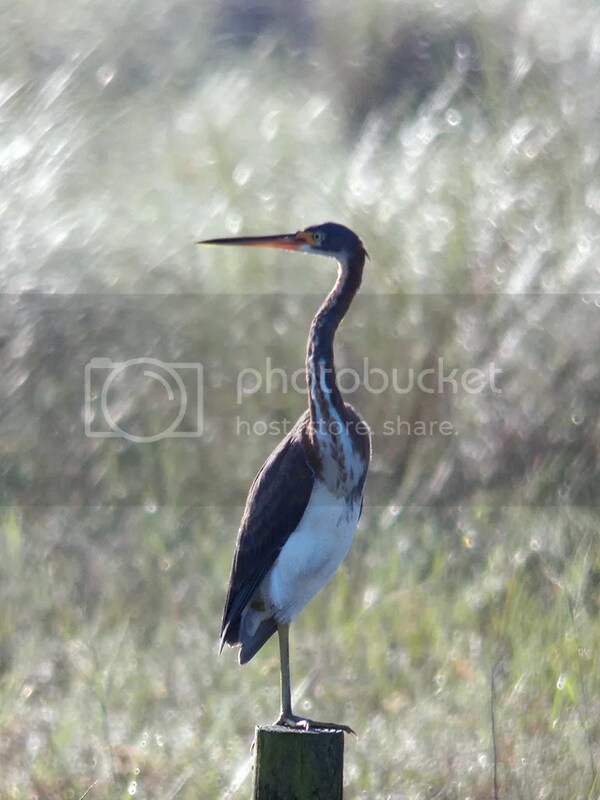 Posted on 2014 October 13 by Lonely BirderPosted in BirdingTagged Birding, birds, birdwatching, Moccasin Island Tract, River Lakes Conservation Area.